Remember those frustrating iOS 5 battery issues? It looks like they’re about to be a thing of the past, as Apple has just released an update to its iOS mobile operating system, iOS 5.0.1, designed to fix the problem. 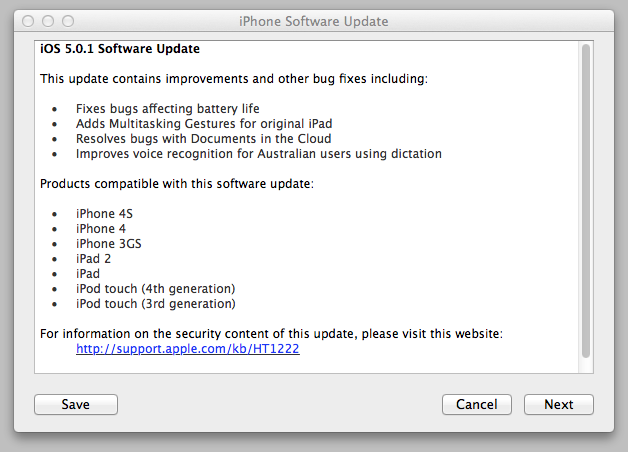 The software update includes a few of other tweaks, too, including bug fixes for document syncing via iCloud, the addition of multi-tasking gestures for iPad 1 and improved voice recognition for Australian users. After customer complaints filled Apple’s Support Forums, the company admitted to finding “a few bugs that are affecting battery life” and promised an update shortly. It was difficult to pinpoint the cause of the battery drains, with a number of suspected culprits being called out, including a calendar bug, a time zone bug and issues with iOS 5’s location services. No matter what the exact cause (or causes) was, it looks like we’ll find out soon if Apple has fixed the problem for good. If you’re not seeing the update pop up in iTunes, click the “Update” button to force iTunes to check for it from the iPhone’s summary page. The iTunes download is 790 MB in size and is taking around 10 minutes to download at present. There’s also a 44.6 MB OTA delta update available that will show up for users connected to Wi-Fi sometime today, if it hasn’t already.